Josh had a baking idea for me: a two-flavored cookie. Interesting, and one with good potential if the flavors and textures are complementary. In the past, I've had trouble baking two different kinds of cookie dough on the same sheet because even though most drop cookies bake at 350F, they often have slightly different bake times. So in trying to combine two doughs into one cookie, I decided to simplify the equation by using recipes with the same bake time. The solution for my first test? Two recipes from Ina Garten. 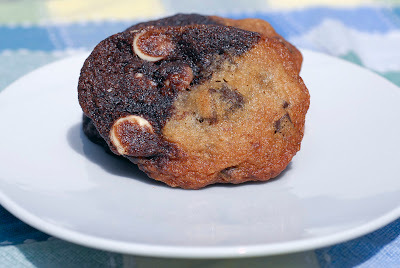 I used Ina's Chocolate Chunk Cookie and Chocolate White Chocolate Chunk Cookie recipes. According to her directions, both bake at 350F for 15 minutes. I made tiny scoops of each - approximately a teaspoon or teaspoon-and-a-half each - and gently pushed them together into a ball. When I was feeling lazy, I used my regular sized scoop and just scooped if half-full of the first batter, then finished off the scoop with the second batter. To tell the truth, scooping method didn't make a whit of difference in the look or texture of the finished cookie. The only thing I noticed is that the dough was harder to work with when it got warm, so I popped it back in the fridge for a few minutes when it got too soft. They turned out well, and they were gobbled up at the Gumbopalooza party I brought them to. Still, I wasn't completely wowed by them. This is not my ideal chocolate chip cookie recipe - it's too buttery - and I didn't like having to sacrifice the taste in that way. More importantly, they looked cute, but not so adorable that looks should outweigh taste. 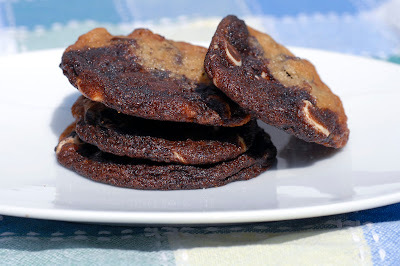 I'd continue to experiment with two-flavored cookies, but I would continue the search for other recipes to match. I did like the color contrast, and if I could train them to bake into a yin-yang shape, that would be a keeper. Cream butter and two sugars until light and fluffy. Add the vanilla, then the eggs, one at a time, and mix well. Sift together the flour, baking soda, and salt, and add to the butter with the mixer on low speed, mixing only until combined. Stir in walnuts and chocolate chunks. Scoop dough onto a baking sheet lined with parchment/silpat using a 1 3/4" scoop. (If you're doing two-tone cookies, make two half-sized scoops and press them together gently. Place them on the tray so the different doughs are on the left and right, not on the top and bottom.) Flatten the dough slightly. Ina says to bake for exactly 15 minutes, and the cookies will seem underdone, but I don't think mine ever last 15 minutes in the oven. Cool slightly on the pan, then remove the cookies to a rack and cool completely. Very Zen. Ying and Yang.